A epic tapestry of tales about alien space wizards, prehistoric nanotech gods, and a virtual reality afterlife. Begin with Season 1, Episode 1. 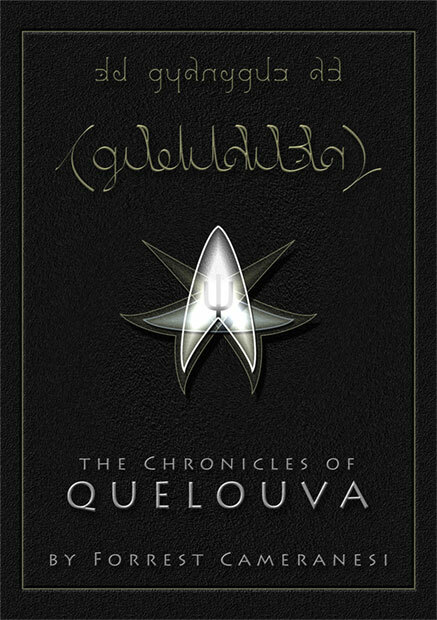 The Chronicles of Quelouva is an epic series of stories spanning tens of thousands of years of fictional history, past and future; epic in the original sense of many small independent stories that connect together into a much larger story. "Quelouva" is the name of the setting, our galaxy the Milky Way, in the language of an alien race called the Ehrban, whose saga composes one third of the stories, chronicling the rise and fall and eventual resurgence of their ancient galactic empire. The entire series takes place in a timeline alternate to our own, though this is only relevant near the contemporary parts of the Oumen saga, which composes another third of the stories, chronicling the mythological prehistory of human civilization through to the post-apocalyptic future. The remaining third of the stories constitute the Sphidi saga, chronicling the events of a virtual world that forgets that it is virtual, takes on a life of its own, and eventually heralds the end of galactic history. The settings of each saga are thus widely different in scope. On one end of the spectrum, the Sphidi saga takes place almost entirely within the simulated world called Virtuality, exploring "inner space" themes. The Oumen saga meanwhile takes place across the entirety of the Earth, its solar system, and even briefly ventures beyond. And at the far end of the spectrum, the Ehrban saga ranges far and wide across the entire galaxy of Quelouva, with bookends reaching out to other galaxies still, exploring "outer space" themes. By the end of the series the scopes converge, however, as events within Virtuality reshape not only the whole world but the entire galaxy, and one human from Earth becomes the only hope for all of Quelouva's salvation. These three sagas are not chronologically sequential, but rather overlap significantly. Each is divided into three parts, alternately spanning time periods of either around a single lifetime, or many thousands of years. These periods alternate between plateaus of high times, for the parts that span a single lifetime, and long periods of rebuilding, for the parts that span many thousands of years. The first part of the Ehrban saga spans a single lifetime, at the height of Ehrban civilization, and is not contemporary with any other stories. The second part of the Ehrban saga takes places immediately after the first part and spans around twelve thousand years, slowly rebuilding from a catastrophe. It runs contemporaneously with but separately from the first part of the Oumen saga, in which humanity slowly build up from nothing. The third part of the Ehrban saga again spans a single lifetime, back at a new height of Ehrban civilization. Contemporary to that run the second part of the Oumen saga, as humanity reaches the height of its civilization, and the first part of the Sphidi saga, where the new virtual world is at its height. At the start of this period the events of the Oumen saga give rise to the start of the Sphidi saga, and the during the end of this period the end of the Ehrban saga finally reconnects with the events of the Oumen saga. The third part of the Oumen saga spans another twelve thousand years or so, as humanity slowly rebuilds from catastrophe; as does the second part of the Sphidi saga, which runs contemporaneously but separately from it, rebuilding from the same catastrophe. Past the end of this period, the events of the two sagas reconnect. The third part of the Sphidi saga, with which no other stories are contemporary, spans a single lifetime again, as the virtual world reaches new heights; and unique among the periods of the Chronicles, this one begins to incorporate elements of first the Oumen saga and its setting of the rest of Earth, and then the Ehrban saga and its setting of all of Quelouva. One way is to read through the entire Ehrban saga, then the last series of the Oumen and Sphidi sagas to conclude that story, missing most of the Oumen and Sphidi sagas in the process. Another is to read the first series of the Ehrban and Oumen sagas as a prelude to reading the entire Sphidi saga through to conclusion, missing most of the Ehrban and Oumen sagas in the process. A third way is to read the first series of the Ehrban saga as a prelude to the Oumen saga, and then the last series of the Sphidi saga to conclude the story, missing most of the Ehrban and Sphidia sagas in the process. A fourth way is to read the first series of the Ehrban, Oumen, and Sphidi sagas, then the middle series of the Oumen saga, then the last series of the Ehrban, Oumen, and Sphidi sagas to conclude, missing only one series each out of the Ehrban and Sphidi sagas. A fifth way is to to read the first series of the Ehrban saga; then the first series of the Oumen saga and the second series of the Ehrban saga, which are contemporary; then the first series of the Sphidi saga, the second series of the Oumen saga, and the third series of the Ehrban saga, which are all contemporary; then the second series of the Sphidi saga and the third series of the Oumen saga, which are contemporary; and lastly the third series of the Sphidi saga, missing nothing at all. A sixth way is to read the entirety of the Ehrban saga in chronological order, skip back in time to read the Oumen saga in chronological order, then skip back again to read the Sphidi saga in chronological order, missing nothing at all. But the canonical reading begins in media res for each saga, and then explores in a spiraling fashion further and further into the past and future of each, unveiling the surprising interconnectedness of stories that at first do not appear related beyond the mysterious recurrence of a symbol common to all three sagas. The outline below contains spoilers for the entire Chronicles. To read through them in the canonical narrative order, begin with Veil of the Foundation: Part 2, Episode 2. In Veil of the Foundation: Part 2, Episode 2, a human exploratory team called the Einherjar crash land on an alien planet, meet a variety of sapient local species, and learn that there is some past connection between these aliens and the Einherjar' superiors back at Sol, the Foundation. In Darak Meij: Part 2, Episode 2, a wizard ranger arrives at a rural town where they are holding a feral young wizard child named Darak Meij, and tries to establish communication with him until disaster befalls them all. In Nadir of the Darklight: Part 2, Episode 2, a reluctant soldier named John meets a camp-follower named Tamara, in whom he confides his doubts about the justice of the war he's fighting, and who turns out to actually be a famous ancient wizard named Thomas in disguise. In Nadir of the Darklight: Part 2, Episode 1, humble farmer John is conscripted to fight in the Chalman army's war against the Orcs of the west, but begins to have doubts about the justice of that cause. In Veil of the Foundation: Part 2, Episode 1, the Einherjar awaken from stasis as their ship first arrives in the alien star system, and upon investigating the system's one inhabitable planet their lander is shot down to it. In Darak Meij: Part 2, Episode 1, Darak first wanders out of the wilderness to the rural town, where authorities attempt to apprehend him and, failing to overpower him, call for outside help. In Darak Meij: Part 2, Episode 3, the infamous terror Mav the Witch-Queen descends upon the rural town seeking to kill Darak Meij, the last Meij to slip through her fingers, but she is driven back by his surprising furious might. In Veil of the Foundation: Part 2, Episode 3, the Einherjar set off across the alien planet in search of a way to escape from it, venturing through the ruins of a much more advanced alien civilization. In Nadir of the Darklight: Part 2, Episode 3, Thomas introduces John to his ragtag gang of warrior-pacifists, and tells them something of the secret history of the world, before being turned mortal by an elf. In Falling of the Darklight, the surviving remnant of a virtual afterlife becomes corrupted and in time gradually forgets that it is virtual, except for two holdouts, Tom and Xiuying. In Lievus Meij, the child of legendary "inventor of magic" Keius Meij, named Lievus, and his half-sister, Kadia Wieg, become heads of rival factions of the "magical" survivors on the Ehrban homeworld. In Meij Endaren, the secret society of "mages" oppose the technologically-advanced Nurbal's plans for space exploration, culminating in an exodus of the Nurbal and their allies to another world. In Rising of the Darklight, Tom and Xiu are reincarnated within the virtual afterlife, and play a part in unchaining the tortured soul for whom it was first built, the "Queen of Hell", who in turn destroys all of it from inside. In Season 4, the Otherworld series, an immersive virtual reality world is constructed, and with mind-uploading becomes an artificial afterlife, which survives the collapse of civilization in the real world. In Season 5, the Pantheon series, immortal humans on prehistoric Earth inspire all ancient mythologies while trying to escape back to space, from where they guide mortal humanity into a utopian future. In Season 6, the Antiquity series, Keius Meij discovers a technological "magic" and transforms Ehrban society with it until their galactic civilization collapses in the face of an alien threat. In Season 7, the Nurbal series, Amouch leads the Nurbal exodus back out into the galaxy to reclaim the scattered remains of the ancient Ehrban galactic civilization. In Season 8, the Resurgent series, Metis is the sole surviving immortal on post-apocalyptic Earth, and gradually guides the remnants of mortal human civilization back to their previous heights. In Season 9, the Virtuality series, the only survivors of the Queen of Hell reconnect with Metis in the real world, accidentally giving the Queen access to Ehrban "magic", and the whole galaxy barely survives. In the Chronicles of Quelouva, an apparently magical world turns out to be a virtual reality afterlife, built by the immortal humans who inspired all ancient mythologies, who were created by aliens with seemingly magical technology. In the Antiquity series, Keius Meij discovers a technological "magic" and transforms Ehrban society with it until their galactic civilization collapses in the face of an alien threat.